We’ve all dreamed of driving our very own “Chitty Chitty Bang Bang,” but that thought has always been a fantasy. How could cars really fly and drive through water? As the video below shows, driving in water is possible (sorry, no flying cars yet). The history of amphibious vehicles is an interesting one. Various sketches and proposals for amphibious vehicles, even including a horse-drawn carriage, date back to the 1700’s. During the tumultuous times of World War II, countries raced to create new technology to put them a step ahead of their enemies. One of the foremost technologies was the amphibious car. Several different types of amphibious cars were built and tested during that time, mainly for military use. After the war ended, there was a lingering interest in bringing amphibious cars to the public. 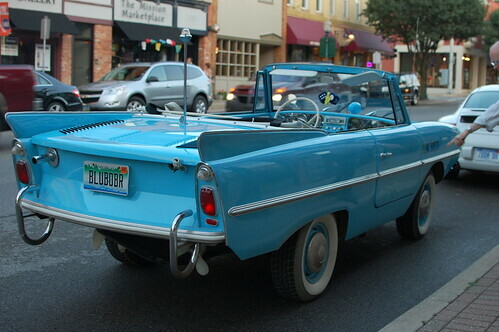 Thus, the Amphicar was born. 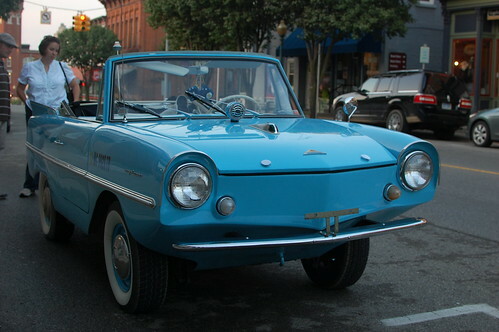 After being introduced at the 1959 Geneva Salon by inventor Hans Trippel, the Amphicar became popular with inquisitive drivers and went into mass production. The Amphicar, being the only non-military amphibious vehicle available at the time, sold surprisingly well for being such an oddity. Over 3,700 cars were produced and sold in the next eight years of production. Marketed in both Europe and North America, the manufacturers invested heavily in the car’s production, shipping the majority of their stock to North America. Over 3,000 cars were shipped to the US, with a retail price of $2,900 each. However, in 1968, the Environmental Protection Agency (EPA) and Department of Transportation (DOT) passed new regulations that hindered production and the use of Amphicars. The strange vehicle that once soared in popularity was almost totally forgotten. However, in 1967, the prominent James Bond film series revived the idea of amphibious cars. In the film, The Spy Who Loved Me, the main character and protagonist, James Bond, drives an amphibious Lotus Esprit across the beach and straight into the sea. 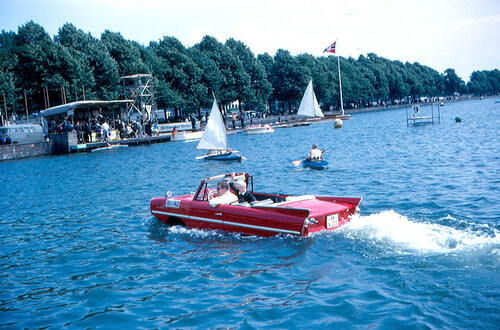 The movie’s popularity revived interest in amphibious vehicles, and collectors and car fans alike began searching for Amphicars in working condition. License: Creative Commons, Flickr, Ellen MacDonald. With a renewed demand, modern companies started developing new ideas for amphibious cars, manufacturing small quantities of cars equipped for land and sea. Gibbs Sports Amphibians built 50 amphibious cars – the Gibbs Aquada – in the early 2000’s. Unfortunately, the company that had been employed to manufacture the engine for the Aquada became unable to supply engines to continue production. Although Gibbs is not currently producing an amphibious car, they have successfully launched amphi-ATVs and a Quadski product. Despite its halt in production, the Aquada is Gibbs’ pride and joy. The few models produced have been demonstrated several times. The car is capable of speeds over 100 mph on land, and can maintain about 30 mph on water. Powered by a 4.0L BMW N55 engine, the Aquada is designed with power in mind – performing impecably on both land and water. In 2004, famous millionaire Richard Branson, Owner of the Virgin Group, test drove an Aquada on the English Channel. The crossing, which took 1 hour, 40 minutes, and 6 seconds, set a new record for crossing the body in an amphibious vehicle. The previous record of 6 hours was set in the late 1960’s, when it was crossed by an Amphicar. Amphibious cars continue to be of interest to the public today, especially after Today ran a story about them last year. For now, it would be tough to find an amphibious car for sale, though you may be able to rent a ride in one. These curious vehicles seem relinquished to the past, but perhaps one day we will once again witness the rise of cars that can roam both land and sea. When not traveling, Chris Turberville-Tully writes for HR Owen Aston Martin. Chris has visited over 80 countries and continues to drive, fly and sail around the world with his wife and kids. Follow Chris' adventures on Google+.